However, worship through song is not common within the prevailing beliefs in the Middle East. As such, there is a shortage of Persian worship material. This is a gap that SAT-7 PARS is helping to fill through Heavenly Worship – a new series of live worship programs to support Persian-speaking believers everywhere to engage with praise and worship in their own language. Persian-speakers have sometimes had an ambivalent relationship with music. There is often little or no music education provision at Iranian schools. While many parents in the West encourage their children to learn a musical instrument, this has not been the case in countries such as Iran. Although this is beginning to change among younger Iranian parents, there are still relatively few musicians and songwriters in the Persian-speaking Church. The church in many areas of the world has had the benefit of worship music going back centuries. In most cases, even the smallest local church has a number of good musicians able to lead the congregation in praise. 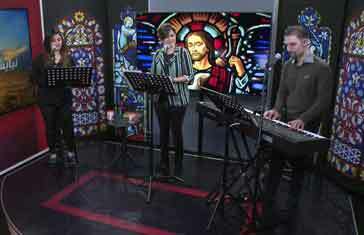 We have a huge repertoire of worship songs available to us in a wide range of musical styles. By contrast, the Persian-speaking church lacks this rich musical heritage. The Lord is doing a great work among Persian speakers and there are now emerging songwriters creating original Persian worship material. Believers in Persian-speaking countries are coming together and connecting with praise and worship through programs such as Heavenly Worship.